Accounting software plays an integral part of a business organization. It shows a view of the financial condition of the business. A business might have profit or loss. Accounting software manages finance and lets businesses to record income and expenditure. Businesses small or big require accounting software to understand whether it is running on profit or loss. 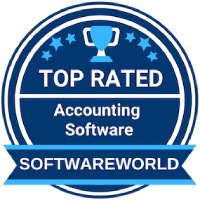 To ease business owners, SoftwareWorld has made a list of the best accounting software for small business. This list will help you decide the best accounting software available in the market. There are many accounting software available for small business. But there are a few cloud accounting software that helps small businesses grow. Accounting software helps in maintaining the general ledger, accounts receivable, account payable, balance sheets, etc. Which are the Best Accounting Software in 2019? About FreshBooks : Spend less time on accounting with FreshBooks; it’s an online invoicing and accounting software for small businesses. The user can organize and track expenses through FreshBooks and its also wonderful platform to get effective reporting. This is easy to use software where you can easily manage your financial records. It’s cloud-based accounting software where the user can send invoices, track time, manage receipts, expenses and much more. “Freshbooks is a simple and straight-forward accounting solution. The biggest benefit we receive is how easy it is to send invoices and get paid online. Freshbooks makes this a lot easier than some of the other solutions we’ve tried over the years. Customer service – it’s amazing. ” – Richard I. About QuickBooks Online : Save time with QuickBooks Online. It’s the smart online solutions for small businesses to control their accounting. You don’t need to install any additional software and you can view all accounts via online login portal. The user can comfortably track income and expenses of business through this software; it automatically downloads transactions from your bank account, credit cards, PayPal, Square and more. The user can create professional invoices and send them from any devices. “I personally like the functions of QuickBooks Online and the advanced accounting nature for solving all the financial reporting issues. The automation of all the accounting operations makes this product unique and the best. It is not a complicated item to use. I see it as the best accounting tool.” – John C.
About Xero : Get a real-time view of your cash flow through Xero; it’s online accounting software for small businesses. The business owner can easily connect to their accountants, Bookkeepers, banks and a huge range of business app through Xero. You can find different helpful features in Xero like easy Professional Invoicing, Mobile app feature for iOS, Android, iPad and tablet users, Inventory tracking feature, multi-currency feature, third-party integration, attachment feature, creating purchase orders and much more. “Fantastic! I finally have the tools from Xero to drive my company to its greatest potential. It’s so easy to share the reports with people at all levels in the company, and I feel a fantastic sense of control with the numbers because of Xero.” – Kristen B. About Wave Accounting : Wave is an innovative accounting software with integrated accounting, designed for small and micro businesses over the globe. Primary features include invoicing, billing, payroll management, payment tracking, finance management, etc. It helps companies improve cash flow, prepare reports for taxation and also gives business insights. As a whole, it covers all the financial aspects of small organizations. It allows users to save time in keeping daily calculations of associated finances. About NetSuite : NetSuite promotes daily financial transactions and accelerates financial processes of a business organization and keeps track of compliance. It is a cloud-based platform with real-time visibility of all the finance related works. With top features such as audit trail visibility, tax management, procure-to-pay, flexible payment acceptance, etc., it allows companies to integrate all the financial reports under a single roof. It is one of the best accounting software for small business. “It wasn’t until I used a different software for CRM, Inventory, and reporting that I missed using NetSuite. It was simple to have different roles and permissions for departments like marketing, finance. The reporting was easy to set-up daily/weekly/monthly reports and have them emailed straight to your inbox.” – Tara H.
About Zoho Books: Zoho Books is one of the best accounting software available for all sizes of businesses. It manages finances, keeps up with all types of compliance, automates business workflows, etc. With features like contact management, purchase order, creative client portals, analytical reports, expenses, sales order, invoices, automatic bank feeds, and others, this solution brings a holistic approach to every financial work of the organization. It is cloud-based and is accessible remotely. About SAP S/4HANA Finance: SAP S/4HANA Finance helps digital age business organizations support financial planning, accounting, reporting, treasury and cash management, etc. It manages all the payments and bank communications, customer engagement and up-selling of the company. Top features include tax management, accounts payable and receivables, expense tracking, etc., and is suitable for small, midsize and large business in the sectors of automotive, engineering, construction, retail, public industries, and research and development. “SAP Hana is a memory data platform that accelerate the business processes,deliver process inteligene. The best multi combination platform that are driven with data platform and as report generation tool. Best part of this software is it removes the burden of maintaining any additional system to hold our data.” – Shaik a. About Bill.com : Bill.com really simplifies your business bill payments. The user can easily pay and process all bills in minutes through this software and it’s also the best medium to get paid the way you want, up to 3x faster. This software sync for automated bookkeeping and improves accuracy level of your records. When users pay or get paid, this software automatically updates. Bill.com is also available for iOS and Android users so it’s easy to operate from anywhere. About Receipt Bank : No more paper just increase your accounting level with Receipt Bank; it’s Automated Bookkeeping and data entry software where the user can find pre-accounting features for the accountant and bookkeepers. It’s impressive accounting software for small businesses that really eliminates data entry and automates the manual work. You can find data extraction feature, instant receipt submission, foreign currency support feature, data export and much more with cloud storage benefit. “Overall superb – The accuracy really is superb! It is amazingly how accurately it gets the information required from what is often messy, crumpled or poor quality receipts” – Graham L.
About Deltek Costpoint : Deltek Costpoint, built for government contractors, is accounting software with unparalleled project management, labor, reporting, compliance, and accounting features. It helps users to improve visibility into every aspect of business and features dashboard, interactive reports, and ad hoc queries. It allows mobile access to all the reports generated and is highly recommended by thousands of contractors worldwide. It is designed to meet small and midsize organizations. “I use costpoint daily at my job and the software is very easy to navigate. I have no issues searching for BOMs (Bill of Materials) and costpoint interacts relatively seamlessly with the systems that we use for engineering drawings and shop floor instructions.” – Tina D.
About Sage Business Cloud Accounting : Built on the Salesforce platform for small and midsize organizations, Sage Business Cloud Accounting helps in sending invoices, receive payments, create quotes and accounting. It allows having control over finance of the organization. With this solution, users make smarter business decisions and expand their horizon of business opportunities. It reduces friction of time and management of the company and boosts productivity and efficiency. About ART : ART is one of the best accounting software that focuses on dynamic, strategic and fulfilling all the reconciliation process of the organizations. It replaces manual controls with automated controls and ceases repetitive tasks of the user. Top features of this solution include reconciliation, reporting & analytics, manage all the functions, reporting, certification, and helps the users with scheduling, system reconciliation, etc. About ActivityHD : ActivityHD provides businesses with all the financial solutions necessary to have a flexible and efficient workflow of finances. It helps organizations to have flexible reporting solutions and features include mass change on records, 100% live system, centralized dashboard, etc. It is capable of handling complex general ledger, payroll management and is integrated with a suite of applications. It interfaces with every third-party application and eliminates manual entry of data. “Ease of use, reporting ability, able to customize reports easily. The customer service department can help set up reports if you can’t figure it out. Ability to export reports into different file types. able to copy from HD pane into Excel. – Christy G.
About Oracle Financials Cloud : Oracle Financials Cloud is one of the best accounting software that streamlines accounts and general ledgers and also compliance with every new revenue regulation. With top features including, reporting, automating expense process, bank reconciliation, personalized dashboards, fixed asset management, billing, etc., it helps businesses today with cutting edge technology and an agile finance team. It allows organizations to refine their business model and meet all the regulations and competitive opportunities. “The modules cover all standard requirements to support the finance organization including countries localizations where necessary. – Patrick R.
About Clear Books : It is simple accounting software for small business and has award-winning online accounting tools. Clear Books allows users to save time and work smart with remote access. Top features include banking, invoicing, reports, purchases, tax, etc. It enables users to track vital financial numbers through dashboards and helps in creating customized invoices with the support of multiple currencies. Users get cloud support with email and phone for more productivity. “Easy to use and has great tools to work with. reports are very useful and helpful to get a good overview of how business is going. Saves time and is effciient. i would recommend to any small business. – Pia D.
About Workday Financial Management : Workday Financial Management is a financial management system that offers accounting, planning, procurement, reporting, analytics, consolidation and projects under a single roof. It helps businesses in setting up core financial management with state-of-art transactional efficiency and productivity. From providing real-time insights to tackling the most significant economic challenges, this solution enables users to have proper auditing and compliance regulations. It is accessible from desktop and mobile devices. “Best software for financial management and reporting. It provides accurate reports and financial tools thus proving to very reliable. It can be used to generate monthly and annual reports therefore help in future financial forecasting.” – Dennis M.
About AccountMate SQL Software : A fully customized and hybrid accounting software for small and midsize organizations, AccountMate SQL Software offers tools and functionalities to manage all financial needs. It is a powerful and flexible solution with numerous customized modules for each type of commercial work. Top features include business analysis, consolidated ledger, inventory management, upsell marketing, accounts payable and receivable, bank reconciliation, etc. It also offers an audit trail via solution-wide tracking of data. “Excellent software for our small business. It handles all of our needs efficiently. Also, with add-on programs such as F9 and custom invoice imports from our other software programs, Accountmate saves hours of data entry. – Angie L.
About Pandle : Pandle is a free cloud-based bookkeeping and accounting software. It is user-friendly and comprehensive. It is one of the most sophisticated software for small businesses in the UK. It is the most accessible software for accounting and keeping all the financial records. It streamlines all the financial records of the company including payroll management, tax estimation, multiple-currency support, etc. It also allows sending bulk email invoices to the clients of the organization. About Traverse : Traverse offers adaptable accounting and business software to small and midsize industries. Top features of this solution include multicurrency inputs, comprehensive audit trails, interactive views and custom reports. It is highly customizable according to the business needs and enables users to have accounting, CRM solution and ERP solution in one software. It streamlines operations and reduces costs of the organization. “Great tool! The user can customize lot of reports, set his favorite views and has tons of features. If the user knows Excel, this program is very friendly and can be learned really fast.” – Lyderma F.
About AccountsIQ : AccountsIQ is a powerful cloud-based accounting software with tools to manage budget, audit, tax returns and cash flows. It is unique in providing accounting consolidation, business intelligence, better decision-making strategies, etc. With enterprise level functionality, this solution features are plan billing, timesheets, inventory management, purchase order management, e-banking, cash flow management, tax returns, etc. About Odoo Accounting : Odoo Accounting includes sales and project management and accounting tools in one single solution. It enriches organizations with a universal solution to help all types of operations. Businesses that look for a single application that does all possible work consider this to be the best software available in the market. Top features include billing and invoicing, bank reconciliation, CPA firms, expense tracking, payroll management, tax management and purchase orders. About Ramco ERP : Ramco ERP is the web-based accounting software, offering businesses to access real-time data related to essential financial reporting and also provides insights into business intelligence. It has multi-tenant cloud and mobile-based enterprise software in HCM and Global Payroll, ERP, etc., for the aviation industry. Users can access their information and manage tasks remotely and are suitable for small and midsize businesses in aviation. About ZapERP Accounting : ZapERP Accounting manages the cash flow, bank reconciliation, expenses, for small and midsized organizations. It is a simple accounting software invoicing solution with a single and unified platform to access all the accounting works. With top features including simplified invoice generation, multi-currency, track expenses, client and accountant coordination, etc., this solution helps companies to stay ahead of their competitors. It allows easy payment getaways integration with PayPal, 2CheckOut and Stripe. “Zap has helped me a lot in reducing stock theft within our organisation as we could not previously properly track incoming and outgoing items. We used to operate manually allowing for people to manipulate numbers and figures.” – Ruvimbo M.
About Accounting Seed : Accounting Seed is an online accounting solution that empowers companies to work at their highest capacity. It is a full accrual accounting and ERP application powered by Salesforce, and it tracks the financial data of the business. A complete finance solution that provides statements designed for regular work, this solution is highly versatile and is used for multiple industries like, insurance, healthcare, software development, etc. About Cashflow Manager : It is a record keeping solution and one of the best accounting software with complete cash book, invoicing and payroll management solution for all the finance related works of the business. Cashflow Manager allows users to have their bookkeeping of the company they own. An easy and effortless accounting software, it helps to automate the accounting processes and saves time for the users. About DataServ SaaS AP Automation : DataServ SaaS AP Automation delivers cloud-based accounting solution to small and midsized businesses. Top features include accounts payable automation, accounts receivable automation, human resource automation, order to cash, hiring processes etc. It eliminates manual accounting and data entry, saving a lot of time for the users to enhance the company’s productivity and efficiency, and also provides 99% pre-ERP data accuracy. “Great collaboration, very helpful and user friendly tool! Easy to use for AP responsibles and approvers, transparency at all levels, easily customizable. Prompt helpdesk feedback. Accesible from anywhere. Flexibility to make it fit the company’s needs.” – Alina P.
About Anaplan : Anaplan is a web-based planning and accounting software that fits into every business function and helps in making better-informed decisions. It allows users to become dynamic, active and collaborative to reach more productivity and efficiency. It covers every single aspect of the business and helps in planning further goals. Supreme features of this software include business rules storage, calculation engine, dashboards and reports, synchronization of data, model building, etc. About Finance Controls & Automation : BlackLine Accounting Process Automation solution improves the speed, accuracy, and reliability of the reconciliation to adjustment process by automating your routine and high-volume transactional processes. Through configurable, rules-based certification and matching workflows, controlled roles-based access, and automated journal validation, creation, and posting, organizations are able to put an end to mundane tasks and enable teams to apply their valuable skills to larger issues that support strategic business objectives. “Great tool for balance sheet recs! It provides visibility and consistency to balance sheet recs. Fairly easy to use. Several different templates available pre-built.” – Debby B. About Infor SunSystems : Infor SunSystems is a comprehensive financial management solution. The extensive range of options includes fixed assets, recurring invoicing, allocations, budget management, debtor management, electronic funds transfer, budgeting, forecasting, expenses and order management. At the heart of the solution is a single, integrated ledger that combines the functionality of general ledgers, sales and purchase ledgers, cashbooks and user-defined ledgers for projects. About TaxSlayer Books : TaxSlayer makes life simpler and less stressful for millions of Americans with exceptional, easy-to-use technology. Trusted for over 50 years, TaxSlayer saves business owners, tax professionals and individual consumers time and money with high-quality, high-value financial products. In addition to offering the top-rated tax preparation software, support, and tools, TaxSlayer’s products are radically transforming the legal, bookkeeping, and HR/payroll arenas, helping small business owners better serve their customers. “Use Taxslayer to do my taxes. I like the ability to important tax documents so I don’t have to sit there and manually punch in things, on the documents I can. Also TaxSlayer does a great job of guiding you through the process and making sure you don’t miss any important details. I felt confident when I submitted.” – Vladimir D.
About Aqilla : Aqilla – simple, affordable and smart cloud-based accounting and business software. Our solution is designed to suit the needs of demanding mid-sized organisations, remotely and 24/7, saving money and time. A feature-rich powerful and flexible accounting software designed for the cloud. Well-managed data, with the benefits of automated backup and disaster recovery protection in enterprise class UK based data centres. One standard application configured to suit individual requirements. “Well designed with a lot of great features for ease of use and analysis. Plenty of useful features, especially the user-defined attributes to analyze your accounting data. Goes well beyond just keeping the books. The people on the support hotline are helpful and knowledgeable.” – Mike E.
About CoStar Real Estate Manager : Designed to meet the real estate management needs of retailers and corporate clients, Real Estate Manager provides a full suite of solutions for real estate and accounting professionals. Analyze and classify leases for new lease accounting requirements, calculate percentage rent obligations, adjust indexed rents and related taxes, process rent and expense obligations, generate journal entries, run financial reports, and integrate with corporate accounting systems. “An Absolute Necessity! This is a great product for anyone in the real estate industry. We are able to utilize this to make sure we are within market values, and to maintain our compliance with our leasing procedures and processes.” – Adrienne W.
About Focus 8 : Established in 1992, Focus Softnet is a global ERP solutions provider with a rich history of innovation and growth. From the first ever product launch, the emphasis was always given to R&D and to build feature-rich products based on state-of-the-art technologies. Our multi-domain expertise, consultative approach and trending skillset makes us a trusted ERP solutions service provider in the technology industry. We have successfully delivered value to over 30K+ clients across the globe increase productivity and efficiency. “Overall Good! Options are good, little flexible, crystal report can be developed, interface okay. It has option to develop crystal reports, unlimited masters available that helps in reporting and decision making. ” – Ghulam M.
About Adra Accounts : The Adra Suite of Solutions allows you to greatly improve the efficiency and effectiveness of your office of finance at period end — quickly increasing the efficiency, control and visibility for all key areas of the financial close process, including: Balance sheet reconciliation, Transaction matching, Financial task management and controls. To confidently prepare your company for a successful future, you must eliminate all unreliable and out-dated manual processes, such as spreadsheets, binders, and emails, from your financial close. “Adra Accounts is simple and easy to use: with 5 clear tabs covering the core functionality, training and familiarisation for other staff is easy – and the colour-coding help clarity.” – jann n.
35. Avaza– All-in-one, Client-focused Project Management for Teams. About Avaza : The team project management software where the user can easily track tasks, timesheets and much more; Avaza is also a helpful option for expense reporting and invoicing; it’s accessible through all devices as well. It’s cloud-based software for resource scheduling where task collaboration, file-sharing, and all project related activities become easier for the user. You can save time with recurring invoices feature and it’s really effective software for project accounting. About FlexiFinancials : Flexi’s powerful accounting software was built to simplify the complex processes that accountants face every day. We understand how stressful the period close is, how complicated multi-entity books can be, and how frustrating audits are when accurate reporting is not easily available. A laser focus on finance and accounting software has enabled our team to scrutinize every step of the accounting process, and develop a solution designed to simplify every task. About Xledger : Xledger is the most automated cloud accounting and ERP solution on the market – used by more than 10,000 companies in 60 countries. Xledger is 100% cloud based – designed for ambitious organizations that would like to take advantage of best practices and automation to improve their business processes. The founders of Xledger set out to simplify business management and reduce complexity by providing an out-of-the-box solution that is configurable to each customer’s needs and built around best-practices. About DEACOM ERP Software : As a comprehensive ERP platform with the industry’s largest functional foundation, Deacom provides a rich set of functionalities and extensibility designed for growing manufacturing and distribution businesses. All capabilities specific to these industries are developed by Deacom into the core platform. This includes: warehouse management, formulation, inventory management, CRM, point-of-sale, direct-store-delivery, lot traceability, forecasting, and ecommerce, to name a few. About FINSYNC : The old way businesses processed payments was decentralized, expensive and insecure. Accounting and cash flow forecasting required data input – often from many systems, and applying for a loan was a cumbersome exercise for borrower and lender. In 2011, FINSYNC set out to solve these problems and help more businesses succeed with a new class of financial software: Cash Flow Management. FINSYNC’s all-in-one platform helps businesses centralize control of payments, manage cash flow and grow. With a vast array of account management software and tools available, it has now become easy to manage an organization of any size with ease. However, type of accounting procedures may differ from one industry to another depending upon projects, functionalities, and assets. Thus the need for account management software required may also vary depending upon compliance requirements and technology platforms. Therefore, selecting the right enterprise account management software may get tricky. In this regard, this Buyers guide will help you choose the right software for your organization. » What is Accounting Software? » Is it worth investing money in Accounting Software? » How does Accounting Software work? » How to choose the best Accounting Software? » What are the features of Accounting Software? » What are the benefits of Accounting Software? » How much does an Accounting Software cost? » Which are the Best Accounting Software in 2019? A business account software helps in keeping a track on the entire cash inflow and outflow of an organization. There are different kind of modules present through which the software works such as General Ledger, Account Receivables, Account Payable, etc. The software also manages the payroll system and takes care of reporting management. These individual modules are basic and can be customized to match the functionalities of any particular industry. For instance, the fund accounting system of a non-profit organization will vary from that of a government organization. As account management is one of the essential systems of a business, it often comes under the Enterprise Resource Planning System (ERP). Manual Accounting process not only takes your valuable time but also costs you a lot of resources. Besides the lumpy racks of old files and complicated financial paper works, it’s almost become impossible to avoid errors. In the era of cloud computing where the need for paper is completely gone, it's crucial for all companies to adopt the paperless world. Accounting software not only fulfills all the accounting elements of an organization, but it also eliminates the complicacy and errors associated with manual accounting. So yes, online accounting software is the future, and it’s better for any organization to adopt it as soon as possible. This module helps in managing the functions towards balancing a business book. The module is capable enough to maintain general ledger functionality and to keep a track on account payables and receivables. Core accounting module also handles fixed assets and bank reconciliation. In this way, it controls all the necessary accounting parts. This solution system assists with tracking detail project cost required to maximize job profitability and efficiency of project-oriented organizations. It helps in selecting jobs that will guarantee better ROI by comparing job costs of available projects with past projects. To be able to better assist in decision making, it takes into consideration many factors such as labor costs, material and other such auxiliary inputs of project management. This type of support system helps mid-level and government organizations to track developmental expenditures. It also assists nonprofit organizations to monitor their donations to stand tall on the requirements of donors. The module makes sure everything run as per standard board regulations. This section of an Account Management application handles inventory tasks including maximizing profits, minimizing depreciation costs, and avoiding overspending to keep the level intact as per requirement. Ideal software applications have functionalities that update inventory information on a real-time basis. To do so, it tracks products, orders, deliverables as well as sales. As per Generally Accepted Accounting Policies (GAAP), there are specific ways to stipulate proper value for inventory. Account Management Software having inventory application takes care of the same with ease. This tool takes care of payment collections. It automates the entire process thereby ensuring minimum chances of human error. It implements timely and consistent payment collection strategies to cater to any billing and collection method. It can handle all kind of business models and operational scales. Budgeting and forecasting are required to map the financial Outlook of any company. Account Management Software can do it by self-analyzing historical data and estimating future conditions. This feature comes handy for organizations where multiple variables account for the forecast. It creates a central database for fixed asset account management. The central database contains asset information, including location check-in and check-out. It also holds information on the due date of return and scheduled maintenance. The tool takes into account audit history, cost and depreciation as well. It automates the payroll system by tracking and processing employee payrolls. The primary functions include generating paychecks, automating tax clearances, formatting legal and tax reports, etc. It can also create reminders to pay taxes in time thereby helping business farms avoiding legal penalties. These buyers run a small business and are on the verge of upgrading their basic systems towards creating a robust accounting system. They need more sophisticated functions than before such as demand forecasting, increased data storage, intercompany accounts, etc. to meet their growing needs. If you are such a company, then you will require your industry-specific functionalities in the software to upgrade your account systems. If you need full enterprise resource planning (ERP) suite, then you come under this type of buyer’s category. The requirements are more than that of small buyers. For instance, in this case, buyers will demand functionality for multi-company consolidation that is often required by large entities. Also, the seamless integration of features involving international operations and foreign currency also becomes bare essential. Buyers of this category look for specific customizable functions designed for them to meet their target requirements. For instance, Non-profit organizations looking for specific functionality such as fund accounting will belong to this group. They need software that can track the payment of donors and can let them know about is an expense. Similarly, education institutes seek for software which can track disbursement of financial aid. On the other hand construction companies look for software which can break down the cost as per projects. Thus, you have to figure out to which group you belong, and you have to choose the software accordingly. Without a doubt, online accounting software comes with a comprehensive financial solution package for multi-faceted businesses. As a business, all you need is software that keeps allows you to efficiently handle your billings, invoicing, financial reporting, expenses management, etc. Apart from that, it’s also crucial to check for some features which make the software standout from others. There comes a time when you might get stuck in some complicated features of the software or face any application error. When the time is money, you can take the chance to wait for hours to get a response to your mail. A phone support feature is all you need while selecting the best accounting software for small business. While some issues are too intense to wait around, some small problems are easily manageable manually. All you need is online support from the software provider, where you can get an instant response for your queries. You cannot install a brand new software and expect your employees to start working on it instantly regardless of how technologically equipped they are. All new learnings take times, and so does a cloud accounting software. Some software allows live or online training to the employees regarding the usage of the app at a simple subscription fee. The billing and invoicing feature of an Accounting Software let you create and send bills in an attempt of a few clicks. This feature comes with extensive sub-features as well. Some apps let you create customized billing template allowing you to personalize your bills and enhance your Brand’s appearance. It also helps in efficient tax handling by capturing all the tax information and let you share the tax break down with the client. The 'reminder feature' keep you and your client’s alert for all due payments. Pay and get paid in time. Some apps come with an online payment gateway, enabling your clients with the hassle-free payment process. If you deal with international trade, then a multi-currency billing support system can cut your critical time consumption in half. The payment is due and gets paid without delay. Accounting software helps you keep your expenditure and income in check and display the results in the dashboard. The dashboard mostly features your sales, expenses, receivables and some other financial elements. The feature lets you instantly generate your cash flow statement, balance sheet, profit & loss statements in a single click. Besides, you can securely share them with your team without letting anyone accesses it. The app will let you share your financial reports through secure features, let you export the document into a pdf file. You can also print the report in hard copies and share them with your team. Some advance financial reporting feature let you schedule weekly, monthly or quarterly reports and automatically send it to specified email addresses. The core accounting feature of an ideal accounting tool lets you create invoices, bills, financial reporting and share them with others. A comprehensive core accounting featured app includes all financial features like GST treatment for items and contacts, GST in transactions, create e waybills for consignment and file your tax returns. All the problematic works are done without going through any complicated process. This feature allows you to calculate your employee’s salary in a few clicks. The app by default breakdown the taxes, allowances and deduction and enables you to generate payslips online. With multiple templates and salary structures, you can create a different pay slab for each employee. With the payroll feature, you can keep your employees satisfied by crediting salary to their bank accounts without any delay and keep them motivated. Although before going for accounting software, make sure it handles statutory compliance including IT, LWF, ESI, PT, PF, etc., allowing you to file tax returns without any complications. This feature allows you to create and add your reports automatically. Some apps let you auto-scan receipts and automatically feeds them in the system. It also allows you to reconcile financial transactions by fetching feeds from corporate cards automatically. You can create a step by step approval flow list which enables you to examine the expenses and get it approved automatically. You can also set up your spending limits, restricting the T&E expenditure of your employees. The feature also includes an audit trail report, allowing you to audit your expenses and leave no suspicious costs behind. The best online accounting software always includes the inventory management feature which enables you to increase your sales by expanding your business in an online inventory management system. It let you integrate your inventory with online selling platforms like Amazon, Etsy, Shopify, etc. It facilitates you features like creating purchase orders, managing online & offline orders, shipments, etc all in one application. Some applications also come with inventory tracking features, letting you track your shipment’s movement efficiently. One can analyze the outgoing and incoming cash flow. It will lead to better decision making. The system can produce a wide range of reports that will summarize the information. As it will take care of many account systems automatically, the organization can have more productive time to address other specific business areas. As it will keep a track on every single expense, it would be easy for a non-profit organization to remain accountable to their investor. It synchronizes everything as per reporting standards and Federal requirements thereby enabling companies to avoid legal penalties in the long run. As it can take care of multiple tasks. Under a single time frame, the organization can save resources in terms of workforce and related expenses. Fetching the cost of Accounting software is easy just by requesting a price quote to your vendor. However, there are other costs associated with the software those need to be taken into consideration as well such as implementation, training, customization, process redesign, maintenance, upgrades, and support. To take care of accounting hassles, this software is a must-have add-on for every firm. However, it is equally imperative to investigate the pros and cons before paying in full thoroughly. If possible go for a free trial and ask the vendor to clear the post handling charges in detail so that you wouldn't repent your decision later and can get the best out of your Account Management Software. » Audit Management - Have you ever come across a software that helps in analyzing the risks of business and also the effectiveness in the internal control of the organization? Companies need to be audited to find out the internal and external errors. » Billing and Provisioning Software - Looking for the end-to-end provision and billing solutions for your business, Billing Provisioning Software is the best option for your business. You can easily make your invoicing process awesome with the help of billing and provisioning tools.